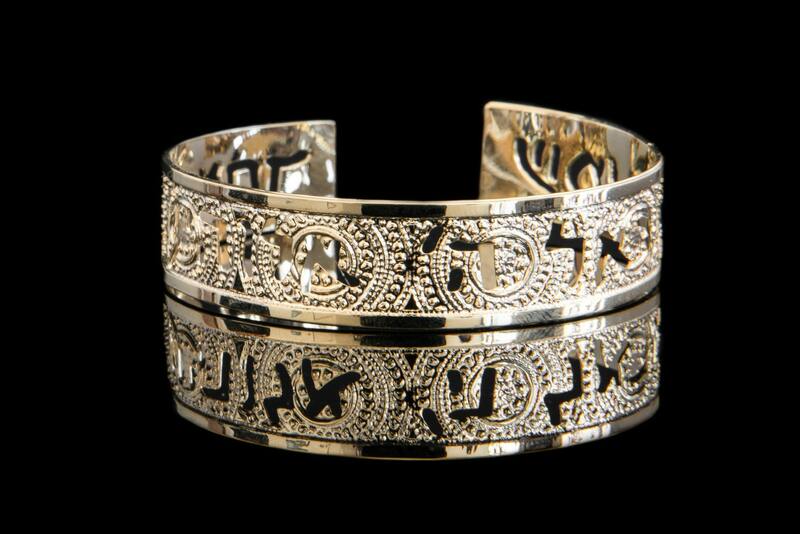 Shma Gold cuff with the phrase "Shma Israel, Adonai Eloheynu Adonai Echad" inscribed around it in modern Hebrew font. 1/2 inch tall cuff dipped in gold with an engraved design. Part of the Judaica jewelry collection I call "Keren Or". The texture on the cuff is incredible - it has the feel of diamond cut that is so bright it shines. The picture truly does not do it justice. "Shma Israel, Adonai Eloheynu Adonai Echad" which translates to: " Hear O' Israel, our God is one"
The gold cuff is about 6 inches around with about an inch opening. It has some adjustability. The cuff is made of 24 karat gold plated brass. This cuff is so great and comfortable, meaningful and special - it can be worn as a bangle as well and wearing trios f them is really fun! Thank you so much for looking at my Gold cuff! I also make other Judaica jewelry in my shop, and I'd love for you to stop by and check out the other cuffs and the rest of the jewelry sometime.